The Thunder Road Half Marathon completely surprised me today. Despite my lack of training and preparation, I still managed a 5 minute PR. I am so excited and in disbelief that I had such a great race. All the signs leading up to the race were pointing to a lackluster performance but once I got out there everything was right on. I love running hometown races. There is nothing like sleeping in your own bed and getting ready the comforts of your house. I woke up at 5:55 this morning, showered and had breakfast and coffee. Same ole, same ole but I had a hard time choking it down this morning. I wasn’t feeling 100% and only ate about half. I quickly dressed – it was painless because I laid out my clothes the night before. Makes for a stress-free race morning when you don’t have to search for things. From the head down: hat, fleece headband, half zip, PBR shirt, two pairs of gloves and cropped tights. The temperature was around 30 degrees at the start and I was anticipating upper 30s at the finish. I ended up giving one pair of gloves and the fleece headband to a friend who was spectating at mile 5. Jen, Brittney, Michelle and I planned to meet before the start. I parked about a half mile away and slowly jogged to the convention center to stay warm. I love that Thunder Road allows you to wait inside until it’s time to line up. We chatted about our pre-race nerves and before we knew it, it was time to line up. The starting area was a nightmare. Complete chaos – we were never even able to get in the line up – we had to fight our way through spectators and go through the fence to even get on the course. The first mile of the race was very congested but things opened up after that. There were a TON of runners this year! I settled into an 8:30 pace early on and was able to maintain around that for the duration of the race. I took a Gu at mile 8 and water at ever aid station. I kept waiting for my body to slow down but my legs just kept running. 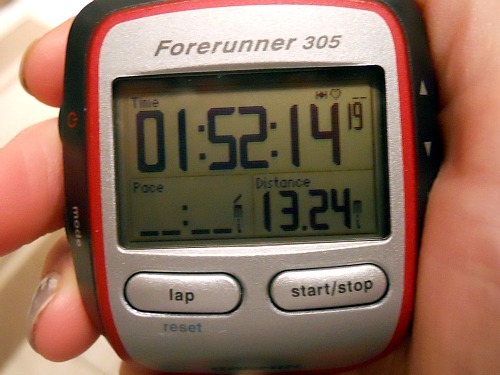 I felt strong, confident and so happy all 13.1 miles! I was thrilled that I was able to run a negative split for the second half of the race. An all-around wonderful race today! The best part was having Brandon waiting at the finish line to celebrate with me. I know he has to be burnt out on coming to watch me race but knowing he’s there makes me so motivated to finish strong. I was happy to find him waiting for me with a jacket and hand warmers. I immediately put the jacket on – I get SO cold after I finish running (and it was already cold out). We hung out for a few minutes so that I could stretch a bit before heading to breakfast. And we ran into Jodi, Meg and Mimi from lululemon on the way to the car. I was going to see them again very soon for cheering at mile 24.5 (more on that later in the post). I was starving after the race and we decided to hit up the Original Pancake House. I refueled with a half-order of blueberry pancakes and a scrambled egg for protein. Totally hit the spot. I said goodbye to Brandon when we finished eating and went to mile 24.5 to meet up with Meg and Mimi to cheer on the marathoners. I got to see reader Lauren and fellow blogger Branny pass by. I didn’t get a picture of Lauren but Branny was looking AWESOME! Congratulations to both of your for conquering 26.2 on such a tough course!!! Today was a really fun day that reminded me again why I love running and the community of runners so much. I’m definitely on cloud nine right now! Who else ran Thunder Road today? Please let me know how it went!!! I ran the half today too and had a PR of 7 minutes finishing in 1:46!! I saw you running, but didn’t want to seem like a creep and speak haha Glad you had a great race, and I agree the starting line was a nightmare. Overall, Charlotte does put on a great race! Whitney – congratulations on your 7 minute PR. That is AMAZING! You are so speedy! You should have said hello! 😀 I really enjoyed the race too minus the starting line drama. Awesome to see so many people participating! How was your first mile SO fast? I couldn’t get around people. I have no idea – I felt so slow at first with all the people. After I broke through a wall of women walking in a line right in the middle of the road (SO annoying), I just took off!? Maybe a half mile in? I know I was sub-8 for the second part of that mile. It was such a crowded course! It was SO ridiculous! I can’t understand for the life of me why people who know they’re going to walk get right up front. It’s maddening! Congrats on a great race and your PR! Sometimes our bodies surprise us, even when we doubt them the most. I so happy to see you Jen! You were at the top of the worst hill, I think! Thanks for your support. I can’t believe I was able to complete it having not run at all since November 20th due to tendonitis. Congratulations again! It’s been an up and down journey for you (with Music City and the injury) but you can finally say you completed a marathon! So awesome!!! I 2nd that – it was definitely the worst hill, especially that late into the race! Congratulations on the new PR! I absolutely love those signs you had, I bet you had people smiling all the way to the finish!! Hi, I saw you running. We have the same splits. I am so sore today. I guess it was the hills. Are you sore? Congrats on the PR. Great BLOG you have! Do you have another race on the calendar? I do not know what to do from now until Jan 8th. I am taking a little break with mileage this week and then ramp up and then taper, I guess. Oh, I am running Disney half Jan. 8th, Forgot that part. Great race. Where did you get the great shirt? I’d love to get one that has my name on it for races. My (very sweet) husband made it for me! I bought a Nike compression shirt and iron on letters from Micheal’s. It was pretty time intensive but the end results were totally worth it. Congrats to you!!! What a great run! Thunder Road was great for me. I told my husband my legs checked-out but my heart & head never did 🙂 That was a tough hill to climb right before we saw you. Even though it was tough, I had A LOT of fun running it! My goal for my first marathon was to finish smiling. I did! And came in at 4:26! Thanks Kelly! I so wish you could have been there with us! You don’t know me but you recently took an Ashtanga workshop with my partner Matt. He told me about your blog and thought I’d say hi. I ran Thunder Road as well, the full. It was my first and I’m ready to do another. I don’t remember your signs, however Matt and a few of my friends were at the same corner in front of Yoga One. That was a killer hill so late in the race. I made Matt and my friends run up the hill with me…lol. I wasn’t sure what to expect in my first marathon so I was liberal in a finish time goal of 4-4:30 hrs. I finished in 4:17. Previous post: Am I really running a half tomorrow?